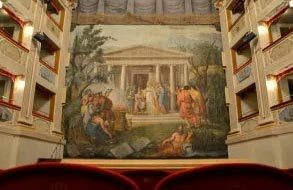 Since the second half of the Eighteenth century and across the Nineteenth century, every Municipality in the Region La Marche, including towns with few inhabitants, started to plan and build its own theater. This need met the specific demand for culture and for the complicated process of social integration. Several beautiful theater were built. I believe that in my blog it is important to introduce you randomly every theater, one by one. Let’s start with Feronia Theater in San Severino Marche, designed by great architect Ireneo Aleandri. He also designed the Sphaeristerium Theater in Macerata (1823) and Villa Caterina in Porto San Giorgio (1825) which was commissioned by Prince Jérôme Bonaparte. 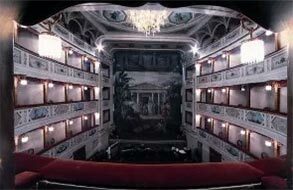 Feronia is a neoclassical theater with 442 seats, with painted decorations by Filippo Bibiena and Raffaele Fogliardi. Its main feature is a stunning acoustics, so that successful concert and prose seasons take place regularly. The typical feature of this theater is that its curtain is actually the original that dates back to the Nineteenth century. It is located in the old town of San Severino Marche, on the side of the stunning elliptic main square (Piazza del Popolo).